From left: Ms Nelisiwe Mabuyakhulu, Ms Minenhle Mhlongo, Sister Geetha Maharaj and Ms Debrah Govender. UKZN’s fourth-year Occupational Therapy (OT) students initiated a community engagement project in Mariannridge near Durban aimed at improving the health and well-being of young folk in the area. Working in collaboration with the Mariannridge Clinic and the local high school, the project – the Youth and Adolescents Friendly Clinic – was initially organised because of concern about the high rate of teenage pregnancies in the district. Initially, only girls at the Mariannridge High School were recruited to join the project. It was later expanded to target both boys and girls at the school, focusing on topics related to substance abuse, self-esteem, sexual health, relationships, peer pressure, stress and time management. 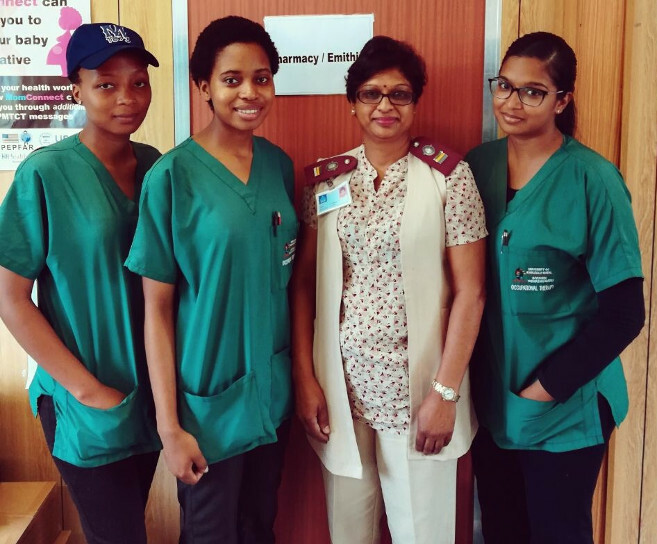 The UKZN OT team comprised Ms Minenhle Mhlongo, Ms Neliswe Mabuyakhulu, Ms Siddeeqah Kader and Ms Debrah Govender working closely with a senior sister at the local clinic, Mrs Geetha Maharaj. At each meeting issues of concern were explored in depth with the learners to help prevent them becoming involved in irresponsible behaviour and situations. ‘Due to the influx of drug abuse and high pregnancy rates, particularly in Grade 8 classes, the team provided motivational talks at the high school,’ said Govender. The project started in February with weekly sessions with the students at the Mariannridge Community Clinic. ‘Building a relationship with Sister Maharaj has been our stepping stone in this project and more so in the community as we have worked side by side with her as an ongoing partner, building an alliance of support in meeting our aims and end goal of good health and wellbeing for the adolescents and youth of Mariannridge,’ said Mhlongo. ‘We want to create an after school programme for the youth in the community to share their stories, provide them with a safe environment where they can ask for help and most importantly, allow these issues to be dealt with in a friendly environment,’ said Kader. ‘Youth are the backbone of the nation, therefore to promote a healthy community, we need to start with them,’ said Mabuyakhulu.